I’ve always been comfortable as a kid growing up to think that when my career is over, I want them to think of me as an overachiever despite the talent that I have. To think of me as a person that’s overachieved, that would mean a lot to me. That means I put a lot of work in and squeezed every ounce of juice out of this orange that I could. POP 5 from 122 copies submitted (update: 5 of 125 get 9.5). One of the most overpaid cards I have, considering a subsequent opporunity half a year later (but not so compared to current MV). I do not regret it as this is the starting point of my more serious pursuit of hobby and more thorough market research and card-locating. The old label was graded in June 06 and BGS number ends with 008. Really wish the super fancy essential credentials /99 version existed for Kobe as in baseball (or /100 in football). 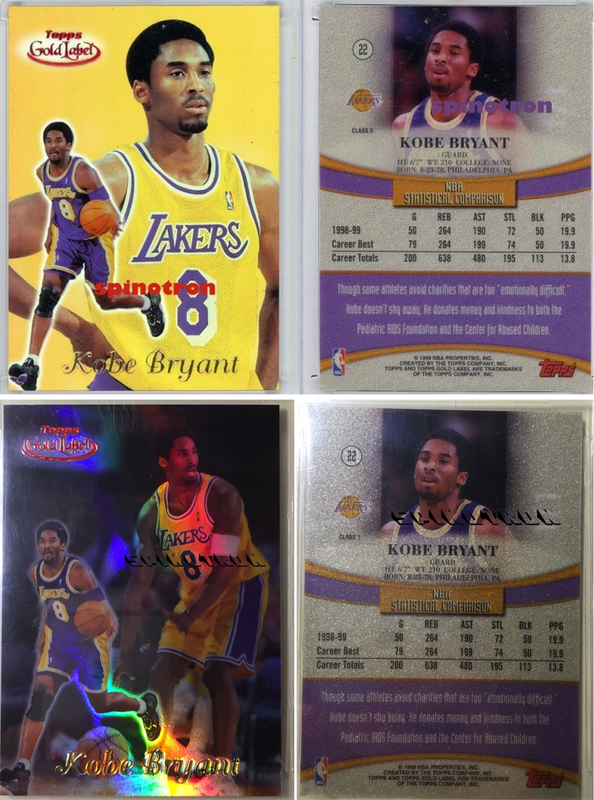 1996-97 Flair showcase Legacy row 2 #/150, the limited version of Kobe true rookie Flair showcase row 2. One of the two product releases introducing serial numbered cards to the hobby. The centering is always an issue to this particular row. No BGS 9.5 yet, impossible anyway. No plan on completing the 96-97 rows, as they are constantly available over time. 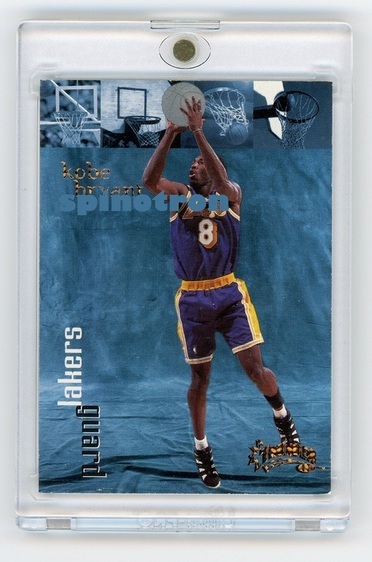 The dream card for any 90s player collectors. The refracting gem-like texture upon close inspection under light is very fitting to the name. The backgrounds of each card in this 123-card set are all distinct and chosen to fit with action shot. First 10 of 100 copies printed are green. One of main attractions besides appearance is that PMG greens are the most limited non-1/1 cards uniformly for all players during the first year (97-98) where limited cards were introduced systematically. Beautiful design, tough-to-pull originally, tough to locate (but more hopeful and heard-of than original 1/1), popularity among other player collectors, market price reference all contribute to elevating this brand into the current status. 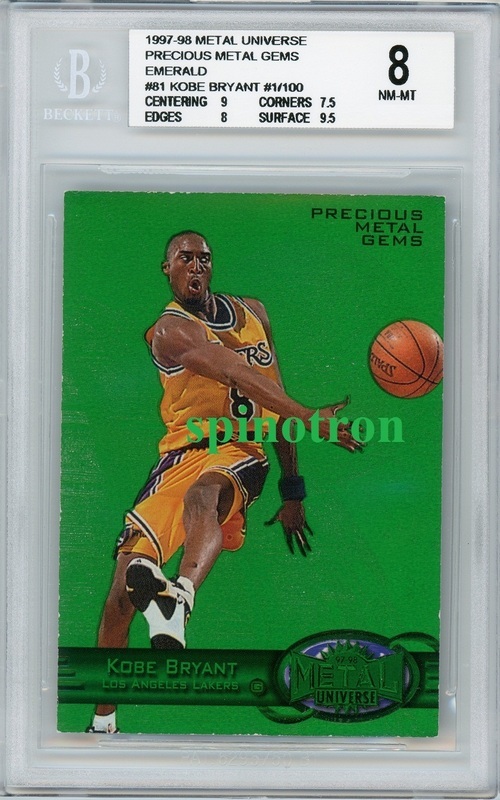 As the timing of writing, PMG greens are greener than any other cards for basketball. 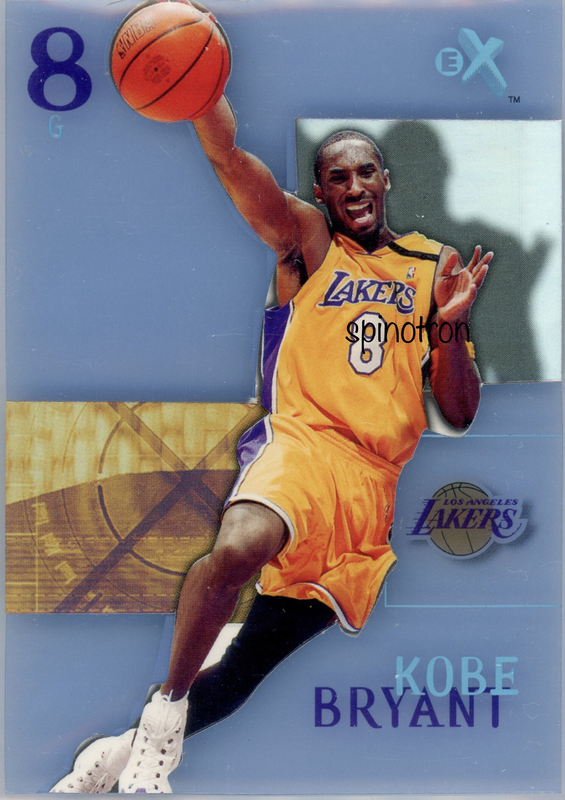 This card is numbered 001/100, so in some sense this is the first Kobe PMG made (Champ came out later). The last 90 copies of 97-98 Metal PMG /100 are in red color. All those PMGs are extremely condition sensitive, and chipping on edges and corners are almost inevitable. 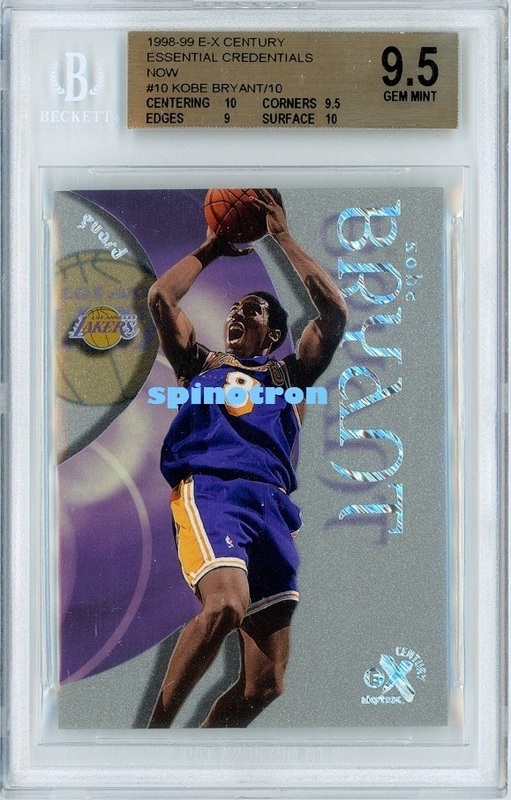 This makes this mint copy especially desirable and treasured. This BGS 9 copy is of the highest grade and is POP(ulation) 3 (another BGS 9 is not in the database due to numbering issue at Nationals). 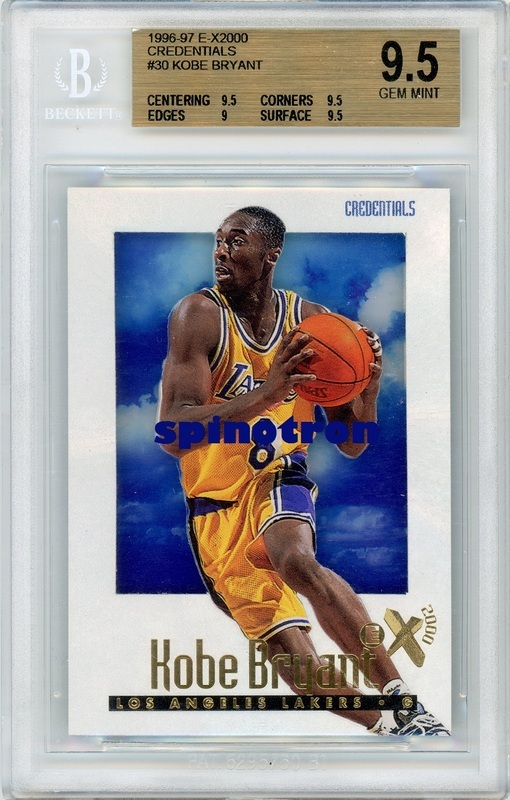 I chose this version over a BGS 8.5 Kobe red available at the same time, and glad I did so. When I first got this card, I had to stare at it every day and found it hard to put it down. 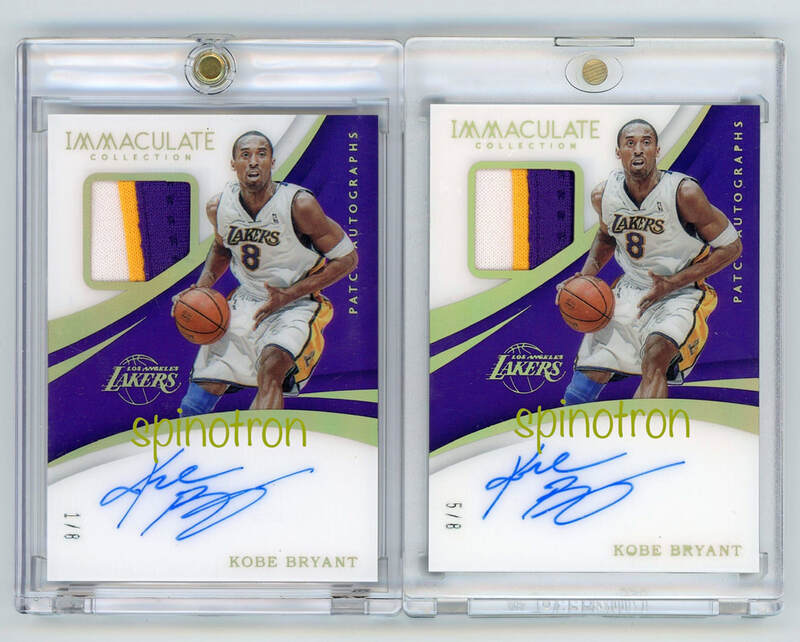 After almost one year of no show on ebay, there have been 6 Kobe PMG red in roughly 7.5-8.5 quality showing up and sold or withdrawn, gradually within several months' span. 1997-98 Metal Universe Championship PMG 8/50. This comes from another Metal product of Skybox. 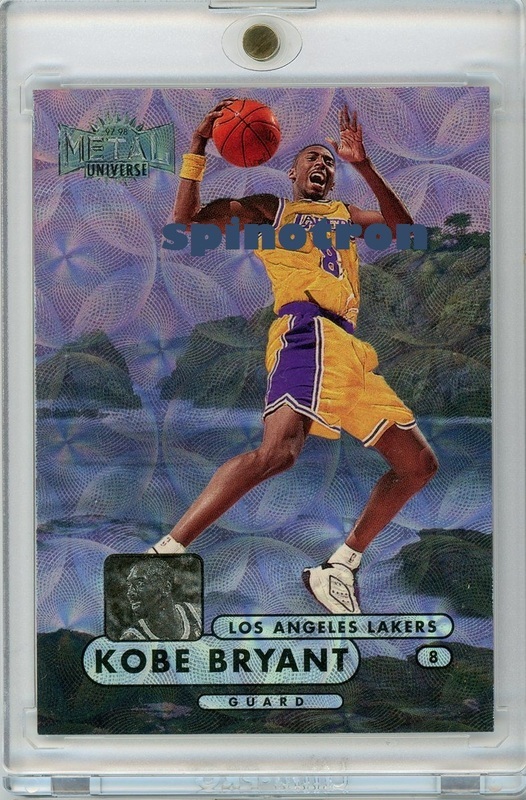 The beautiful design of both front and back, unique landscape background and refracting surface pattern make this one of very top cards among those cards issued with 50 copies in 97-98. It is also very condition sensitive, but less so compared to PMG green and red. Being jersey numbered and in good condition makes it extra special. I passed three copies before running into this. Sometimes it pays off if patient. 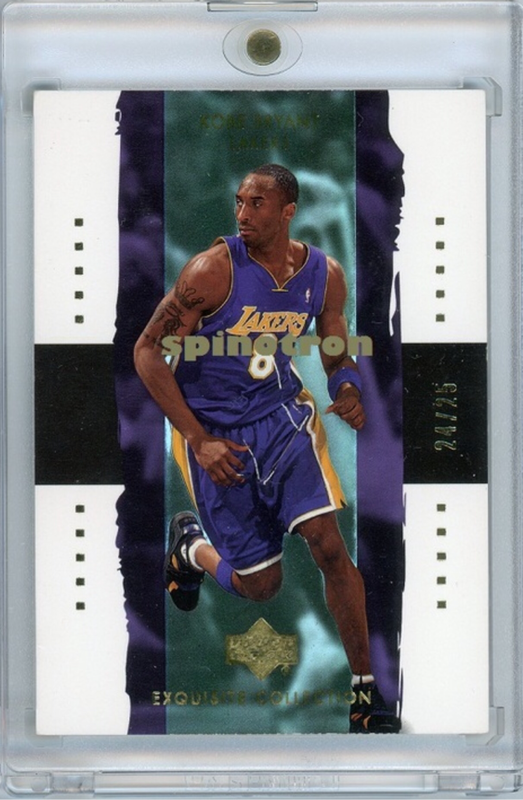 This is the second best Kobe's non-1/1 90s card, being the one of two most limited cards issued in the year where serial numbered cards become a norm in products. The numbering is very creative. 80 players are placed in a carefully thought-out sequence, and in the Now set, each player is only issued with the number of cards equal to its numerical position in the sequence. Transparent acetate stock and great action picture cropped out from otherwise distracting background. The credentials cards come from a high-end product with relatively small release. It is estimated that on average 1 credentials card can be pulled from every eight boxes, and a box price can run 280-300 nowadays last time I checked. 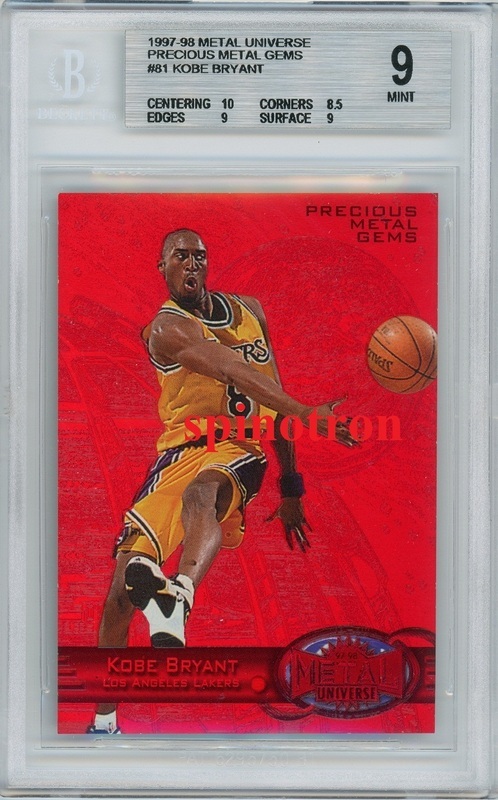 Used to be the crowning card for Tom's amazing 9.5 Kobe collection. This is my first duplicate card. 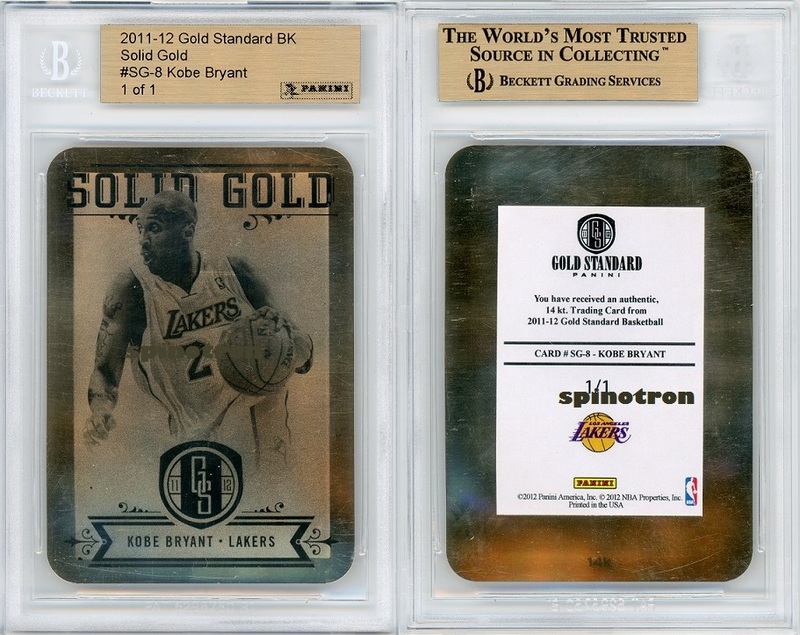 In the hobby some very passionate collectors can go after entire print run of a given card. 6 of possible 8 cards have surfaced before and I located all 6, but the other 4 have been locked up and treasured in distinct top collections, therefore not available in near future. 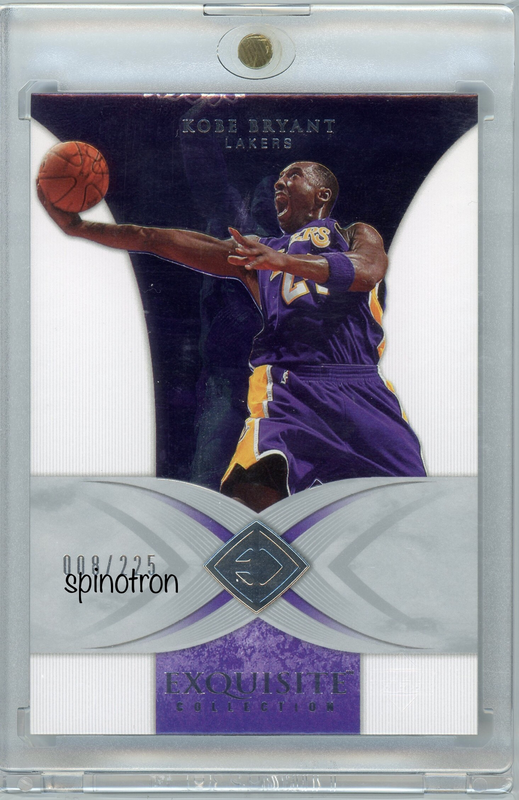 This is the first extremely limited Kobe card I obtained, and thus it has great sentimental value. 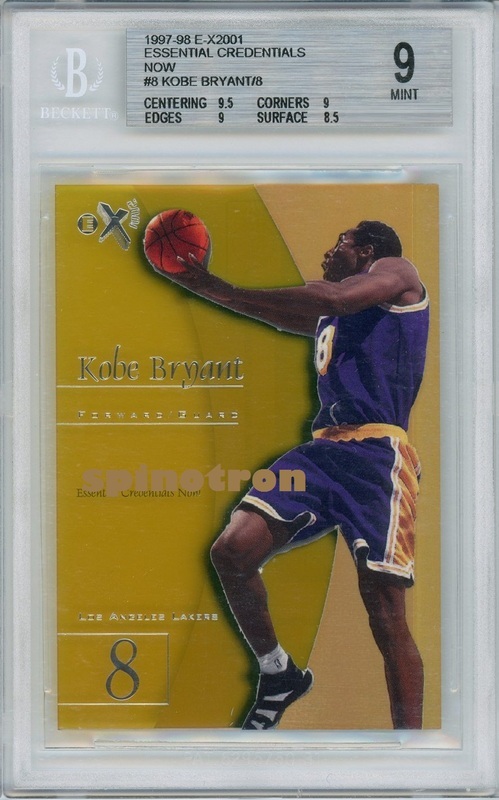 Thanks to a top Kobe collector Corey for kindly letting it go to me. 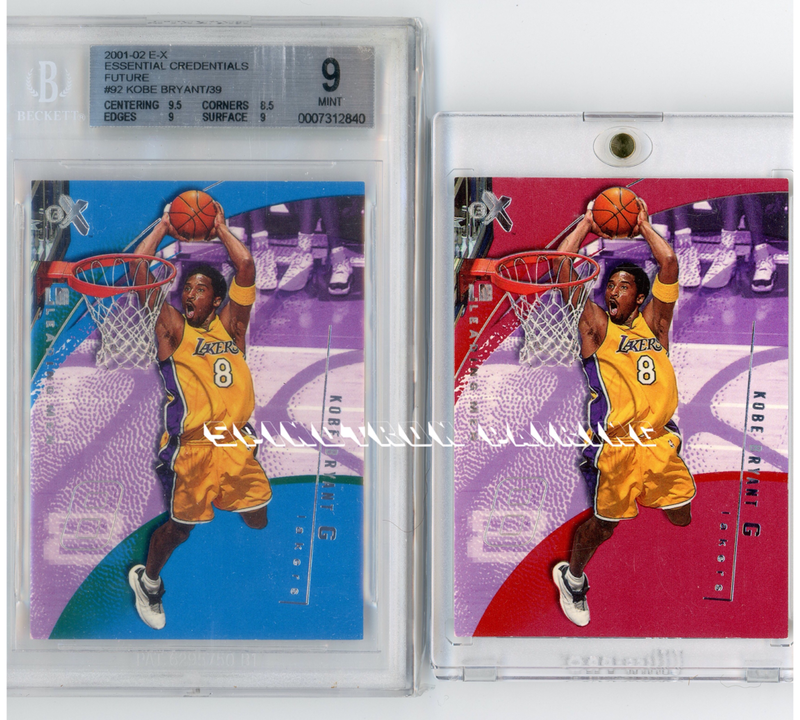 Would love to add a 9.5 future to complete 9.5 rainbow in 97-98 one day, preferably self-graded. But this one holds a special place. 1998-99 E-X Century Credentials Now /10. This belongs to the second year of credentials now. Due to retirement of Jordan, this is the most limited version of the best player available. Silver opaque acetate and beautiful refracting lettering build on many appealing features of the inaugural release. Narrowly won this card in raw form, thought it's a 9.5 or 10, and recently graded it gem and completed gem streak officially. 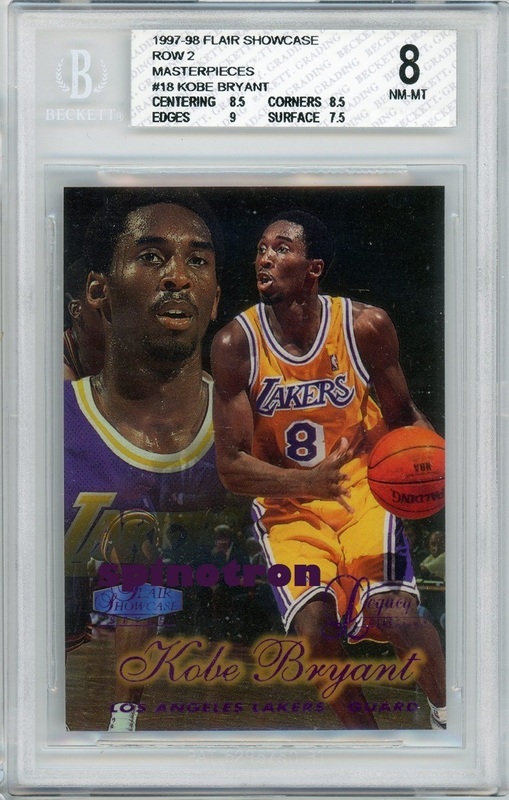 This is one of THE earliest 1/1 ever introduced into hobby. This key idea was introduced in 97-98. It is signified by the purple font and also the exclamation on the back saying "the only one of one masterpiece". 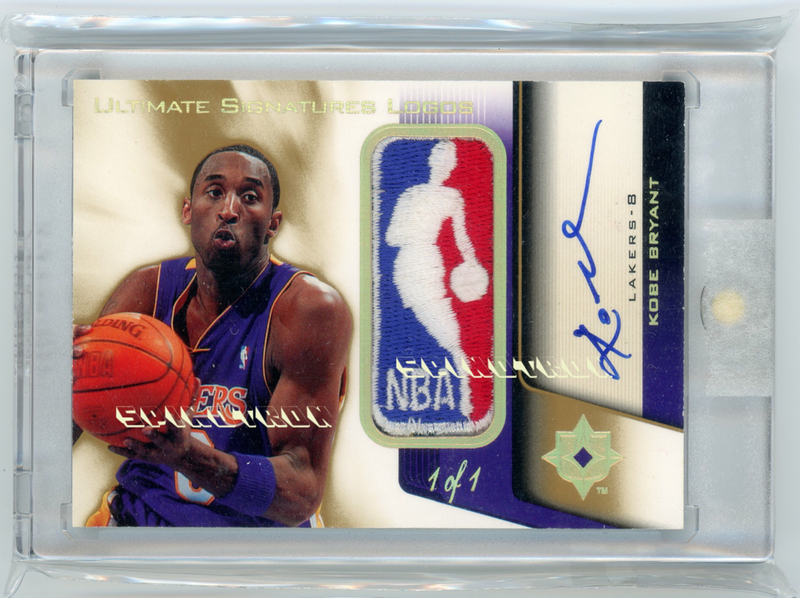 There are only 6 of 1/1s of Kobes in this first year (4 Flair and 2 Ultra, excluding TSC plates), and those 1/1s are easily the best 1/1s of any given player in that era. 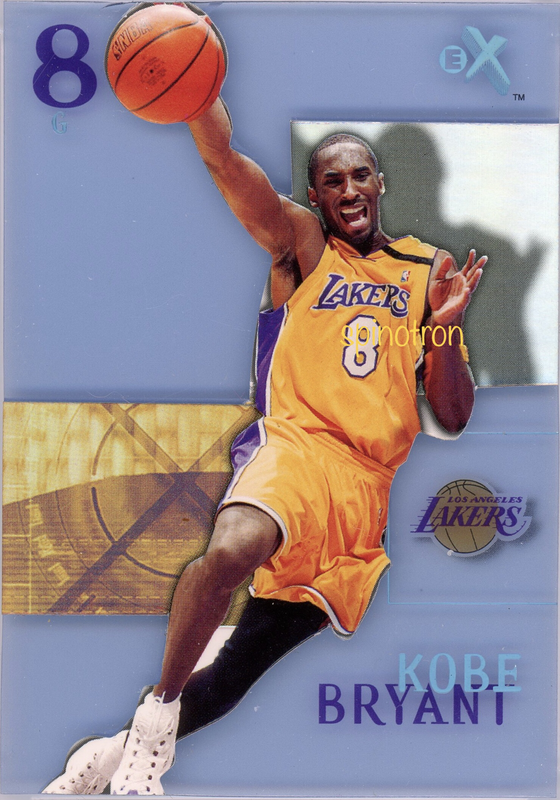 01-02 Fleer Masterpiece. The only 1 of 1 among all products in a given year and the only year during which this is the case, (disregarding buybacks and plates). 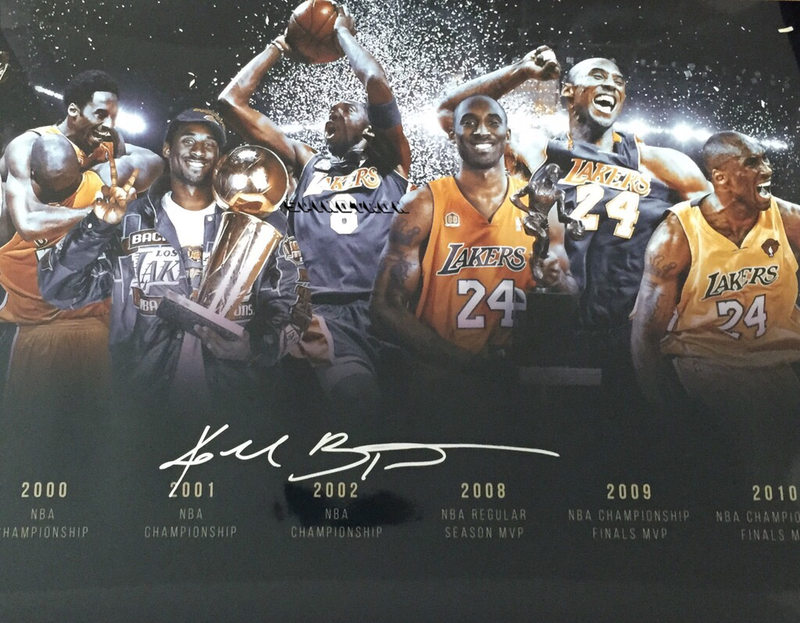 It is also from the year of Kobe's threepeat. 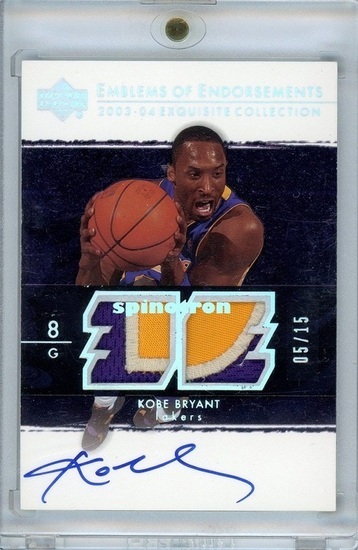 1998-99 Thunder Super Rave /25. 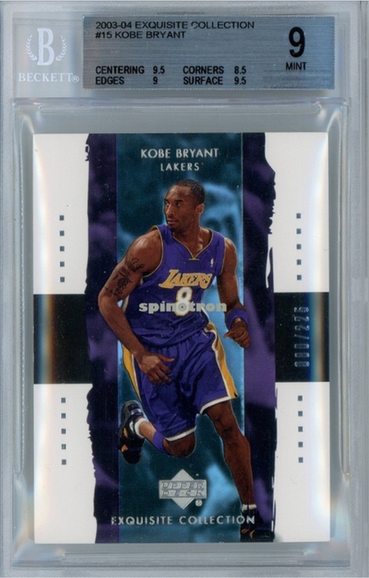 25 copies might seem a lot, but this Kobe was the very first time the world has seen it (before it a knowledgeable Kobe collector thought this card does not exist). 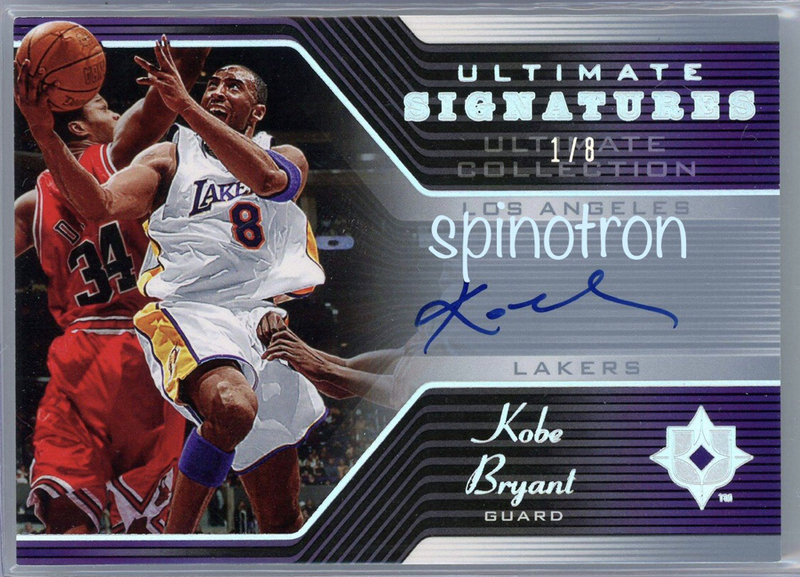 This card comes from a low-end product in a lock-out season with astronomical odds to pull. There are several theories for its extreme rarity. Theory one: It is believed that due to overproduction (optimistically based on popularity of hobby at height of Jordan's career in the previous year) and cold market (due to Jordan retirement and lockout) boxes and boxes of them just sat on shelves and failed to move, so the production halted and many boxed were disposed of. Theory two: Only very few of rave/super rave cards per each player were inserted, so actual numbers of copies are much much smaller than 125/25. 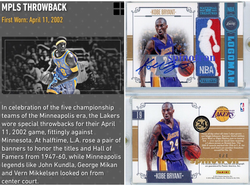 Theory three: The parallel looks so similar to base, so many cards might not be recognized and survived (but no such problem for baseball/football cards issued in the same period, as we can see their abundance on ebay). Theory four: They have been hoarded from the start (impossible as for all players usually only a couple of copies showing up ever, large checklist and 20 + copies to hoard is impossible, and this card isn't a best product to hoard for, another indication of finanical impossibility is MV in 99 was 3000 for MJ super rave /25). 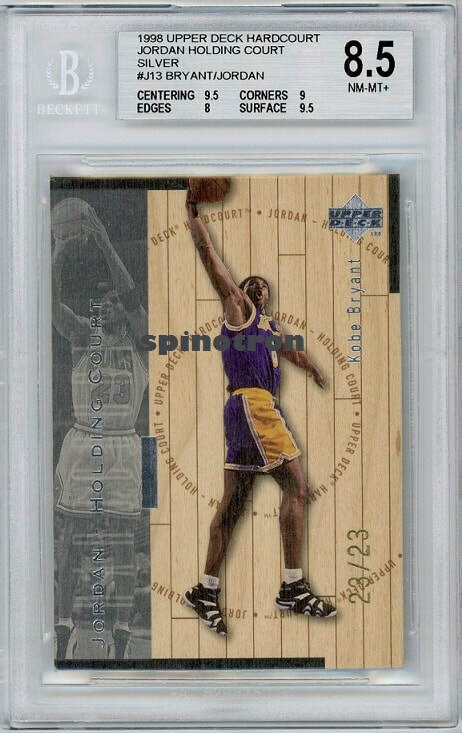 The big mystery of its rarity and super rare appearance in bucket/market make them highly coveted and even deemed as the holy grail for player collectors (as it is usually the last card to complete their 90s PC). In comparison, there have been two graded Jordan supe rave /25 shown up, and a couple existed in videos unconfirmed whether there have been any overcounting among the four. 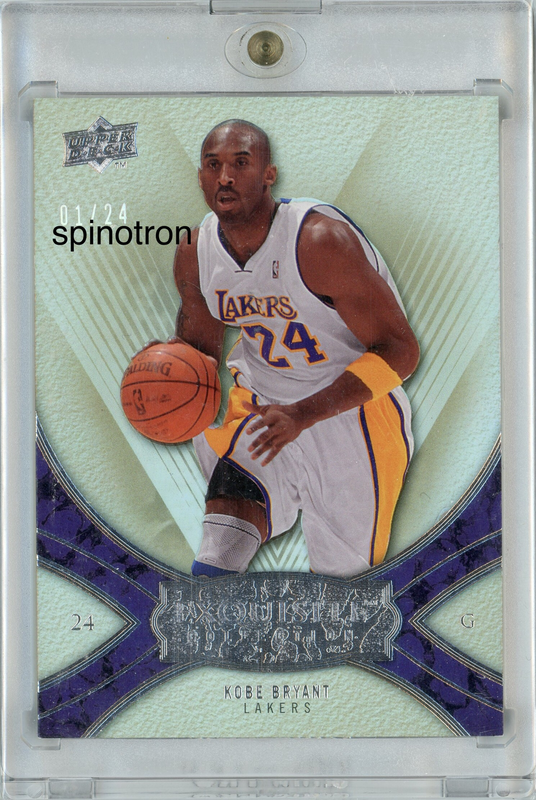 If you ignore printing plates which are always issued in the lots of four and not highly regarded, this is the first Topps 1/1 of Kobe. The efforts of getting this card cannot be underestimated. There are four (or twelve?) 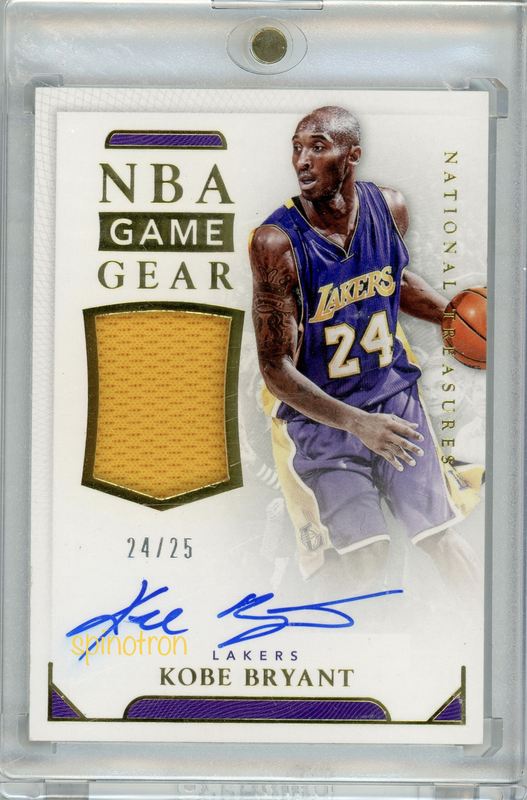 1/1 Kobes in this product. 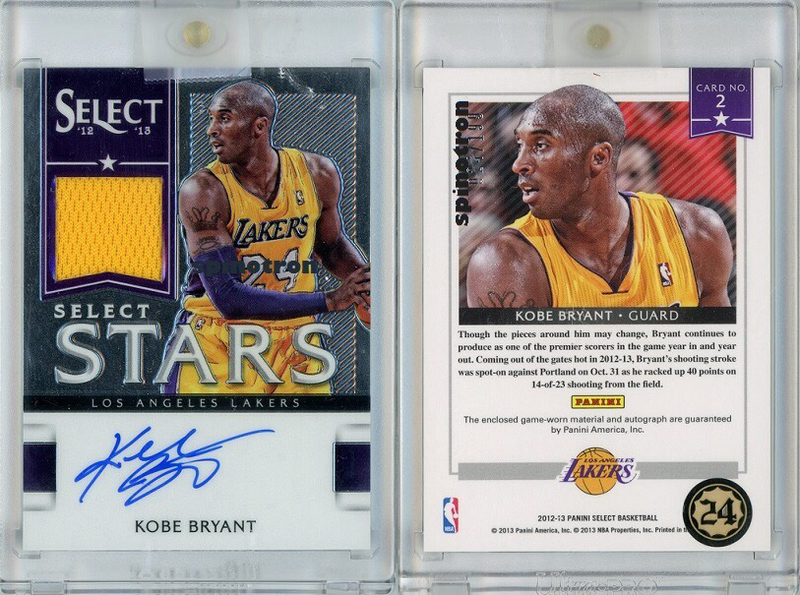 The top 1/1 is class 3 and has rarest next level parallel, and the bottom level is class 1, bought during my trip to watch Kobe's farewell game. 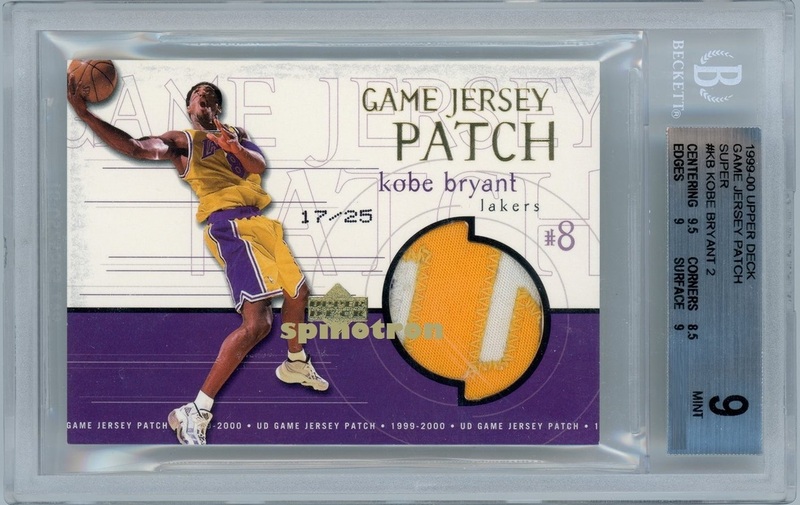 99-00 Upper Deck 2 Super Patch /25, first patch card of Kobe. 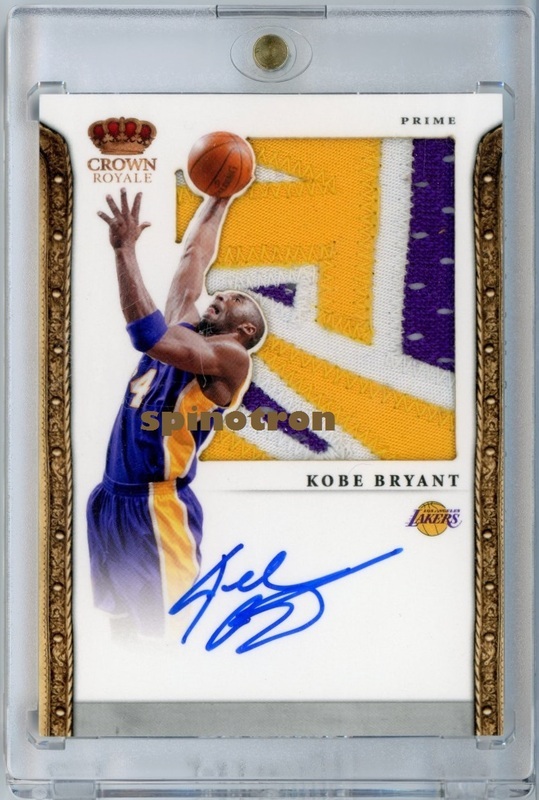 Kobe’s first ever auto patch card. 03-04 Exquisite base 080/225. So called reverse jersey numbered. 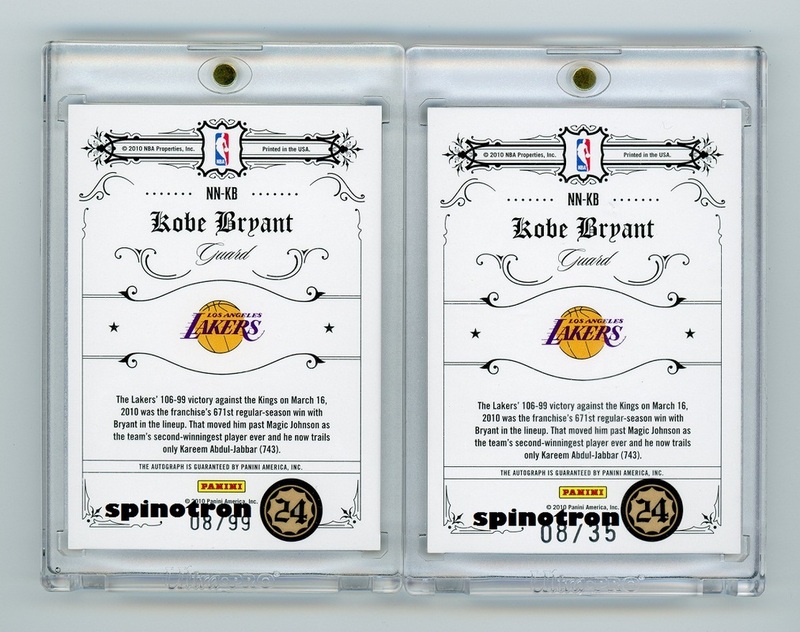 :P Hard to get 9 or higher for Kobe, whilst there are more than 5-6 Jordan gems. Self-graded. 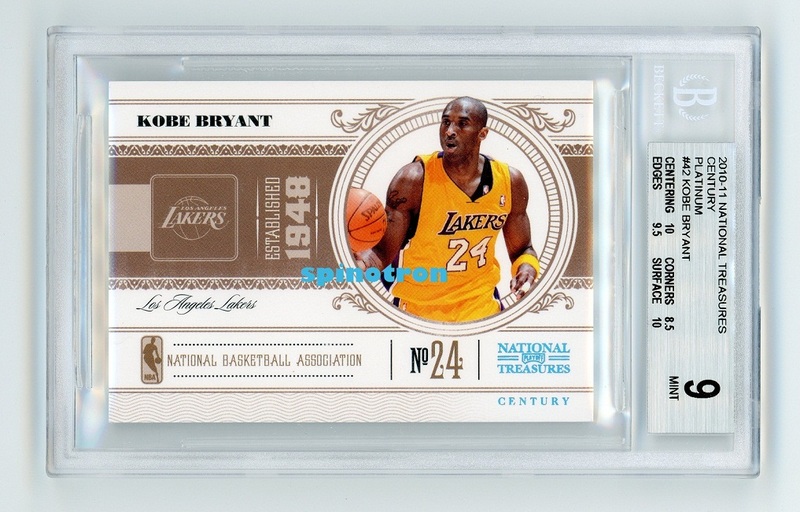 Base gold 24/25, probably the number to retire for Kobe. Base rainbow 1/1. Nothing more needs to be said. 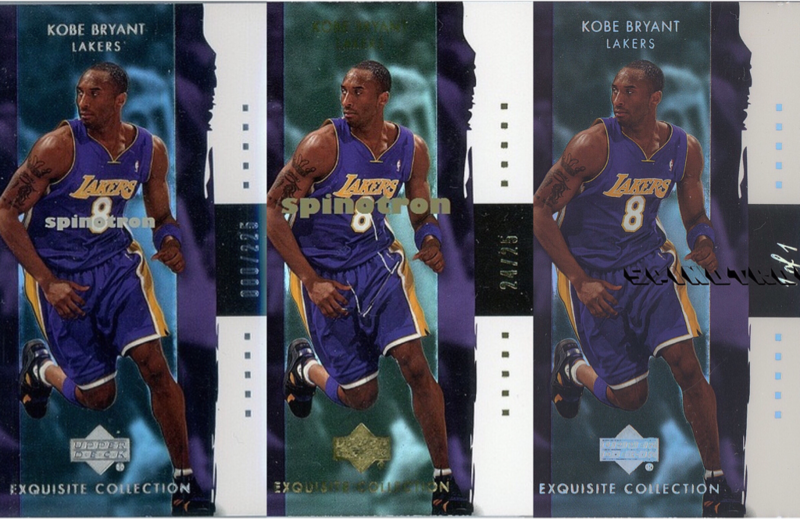 03-04 Exquisite Extra jersey 1/75 and dual jersey 1/25. Matching first number pairing. It is the small and yet beautiful symmetry and historical significance that keep the collecting fire burning. 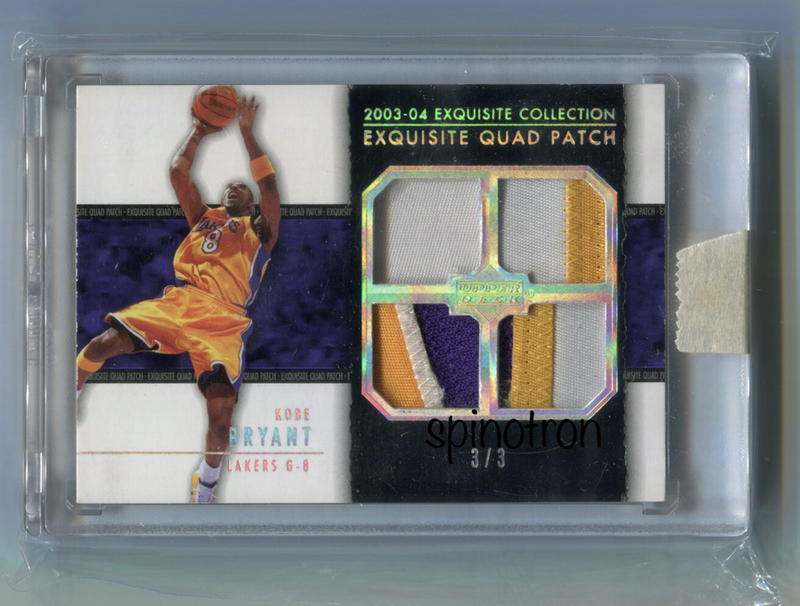 2003-04 Exquisite Collections Quad Patch /3. My first card obtained by trade from a top collector Anthony. 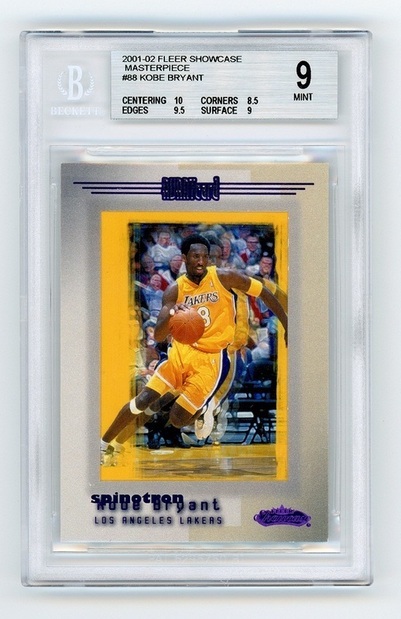 This card somewhat makes up my lack of emphasis on Exquisite Collection. The other two copies belong to world's top Exquisite card collectors. The patch featured here has 1, 2, 3, 3-color sequentially (a natural rise to the max color). 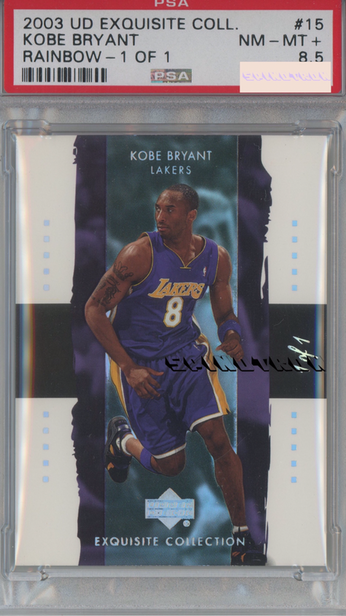 Whilst there are four 03-04 Exquisite 1/1 with Kobe on, this is the only version of the rarest non-1/1 Kobes in first year Exquisite release (unlike Triple Patch /10 having two variations). The numbering is also the sweetest among the three Quad cards. 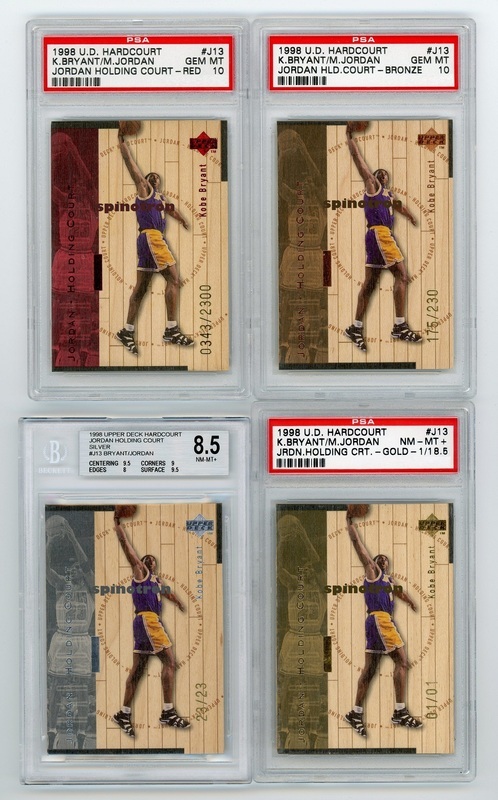 2003-04 Exquisite Collection Number Pieces 8/8. 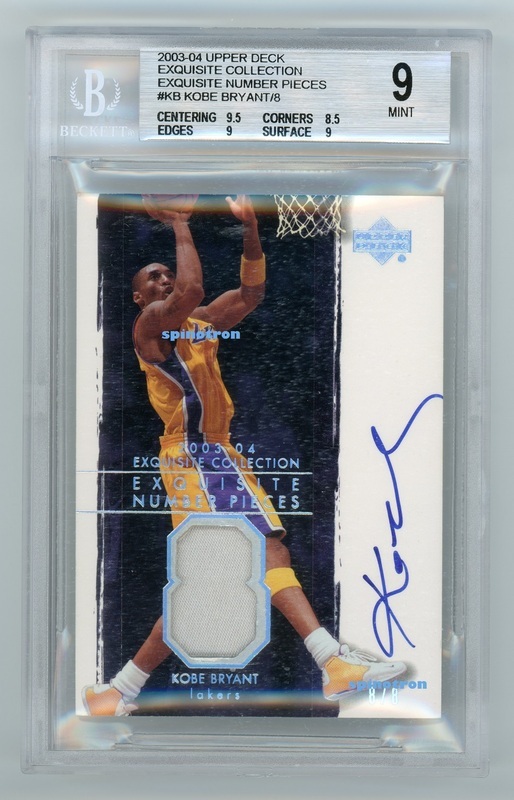 Kobe's early auto /8 are very hard to come across. This NP /8 is certainly a tall mountain to climb. Jersey number in NP featuring numbers as theme is most meaningful. First year exquisite is very conditional sensitive. Being mint among 8 copies is not a given either. 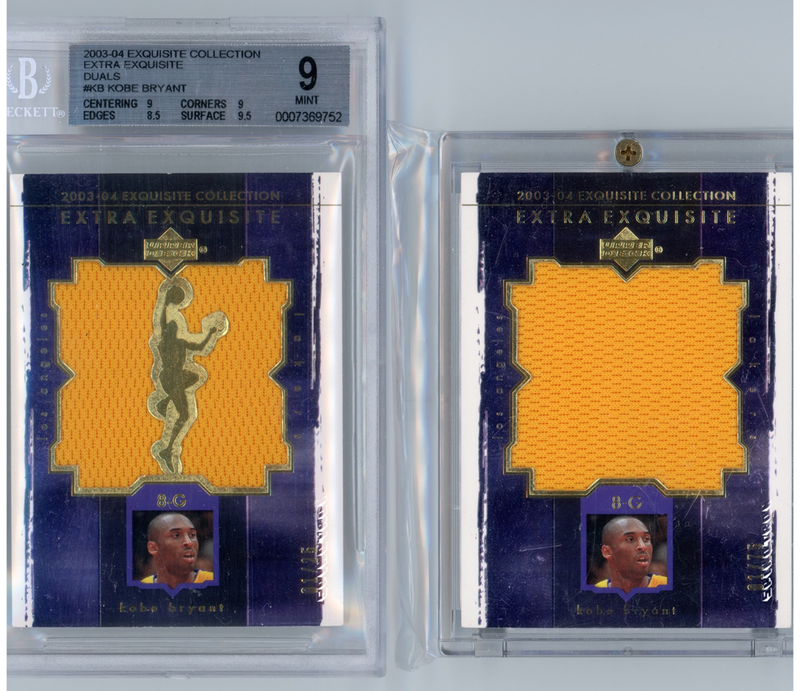 Since all four 1/1 featuring Kobe in 2003-04 Exquisite have been locked up, this card and the one above are the two most rarest 2003-04 Exquisite Kobes one can hope for. Both last numbered. 03-04 Exquisite Collection Emblems of Endorsements /15. This is probably one of Kobe's best non-1/1 exquisite, if not the best. I only saw 4 distinct pictures over the course of my collecting. 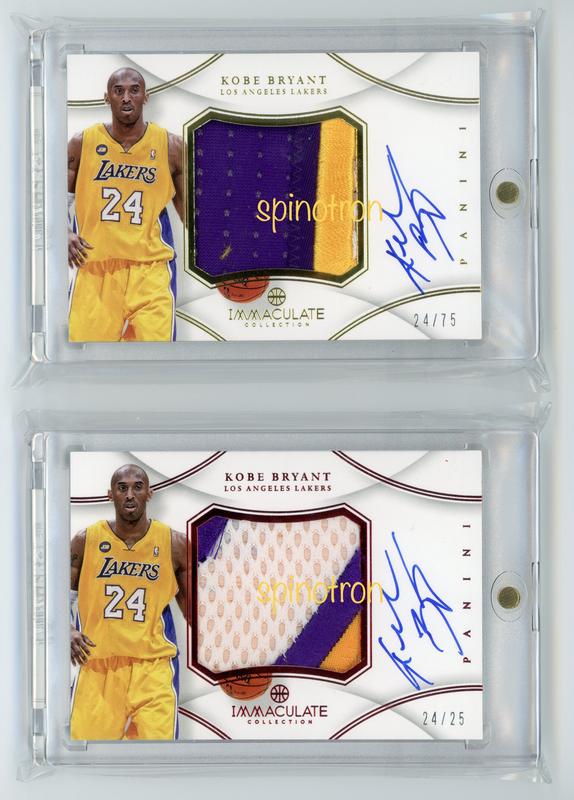 Very hard to have nice condition, patch and bold auto (not running off edge) like this, if one can find one at all. Noble Nameplate features a piece of patch from nameplate part of jersey. Nice to have 13, a draft number for Kobe. 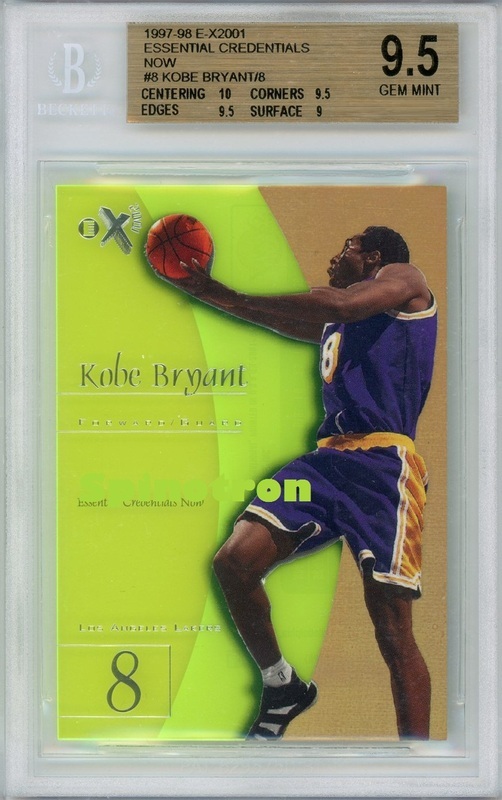 The above four cards, including this one are the Mount Rushmore of my Kobe 03-04 Exq PC. 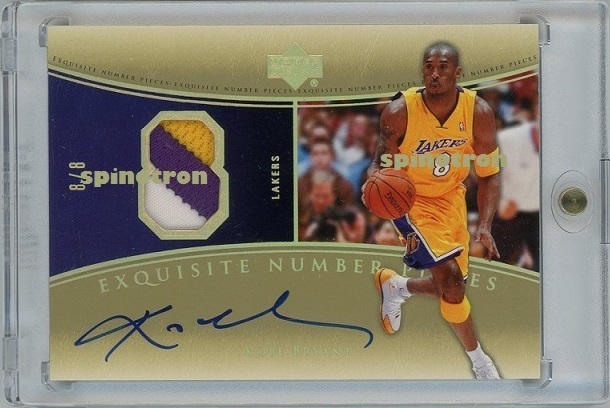 Kobe only has two Exquisite /8 cards in Exquisite's 7-year run. This is the only other card and it is in 8/8 too. Patch is of three colors and tastefully placed in the 8 patch window. 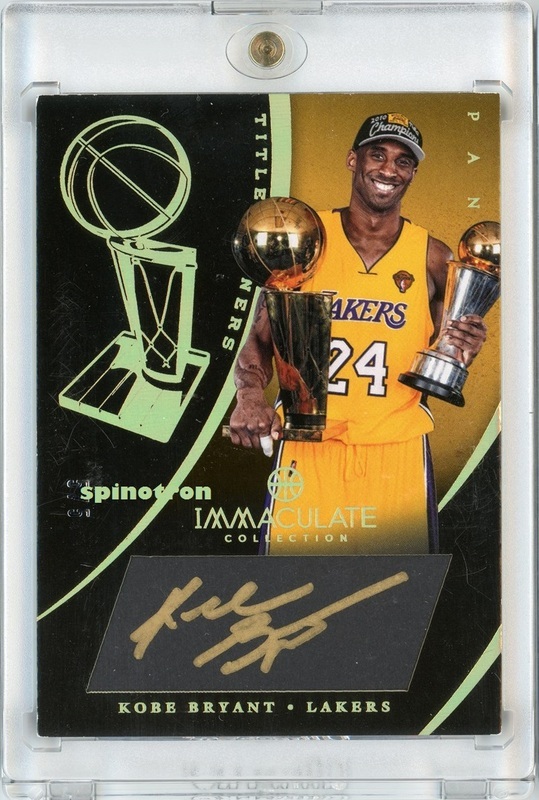 This belongs to a category of cards called inscriptions. 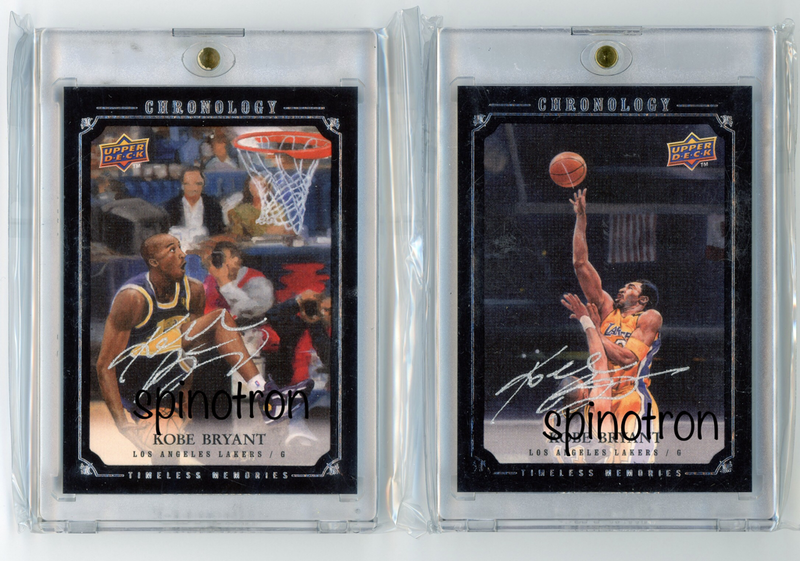 Two of my fave Panini cards ever made, and they represent first year of Panini basketball pretty well. 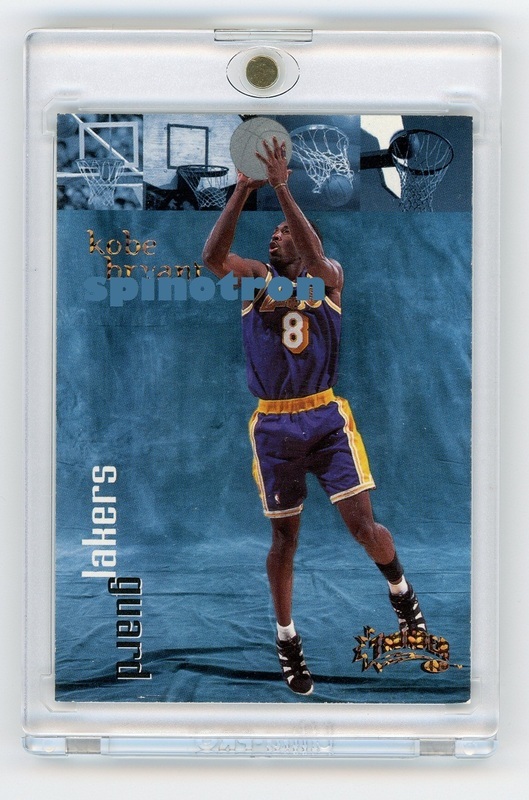 Black Mamba 8/99 together with MVP inscription is 8/35, latter of which has not been widely released. Thanks to Reza and Jamison for this matching pair of old jsy number. Kobe 10-11 NT base 1/1. I like second year NT design better. The very foundation of various logo-tag, team-tag, laundry-tag and tag auto'ed versions. 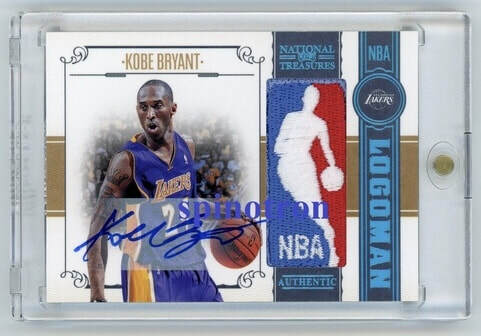 2010-11 National Treasure Logoman Auto 1/1. This card was pulled by a prominent case breaker Michael, and then I obtained it on the same day. The logoman patch came from a blue Minneapolis throwback blue jersey (which has also been used in patch cards in Gold Standard product), very rare and special. 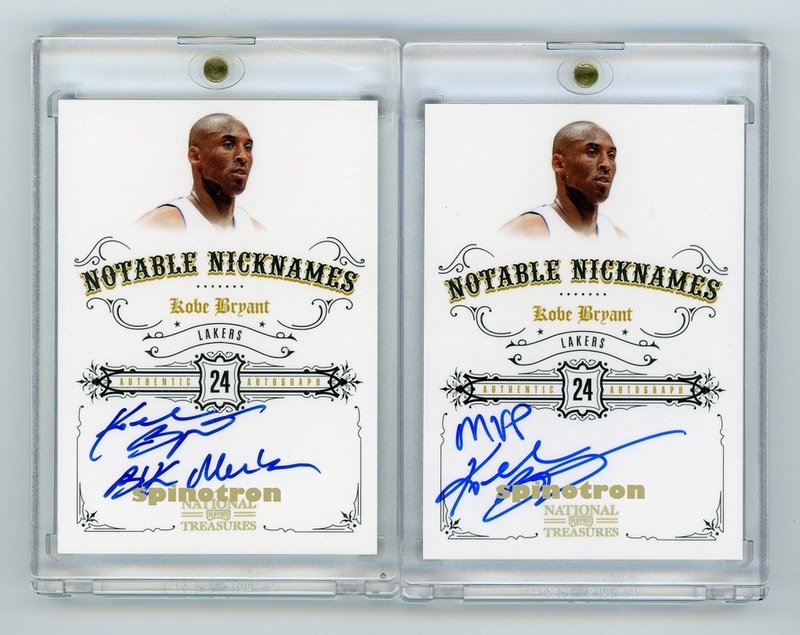 This is also the first year in National Treasure where only 1 Kobe logoman auto 1/1 is allowed. 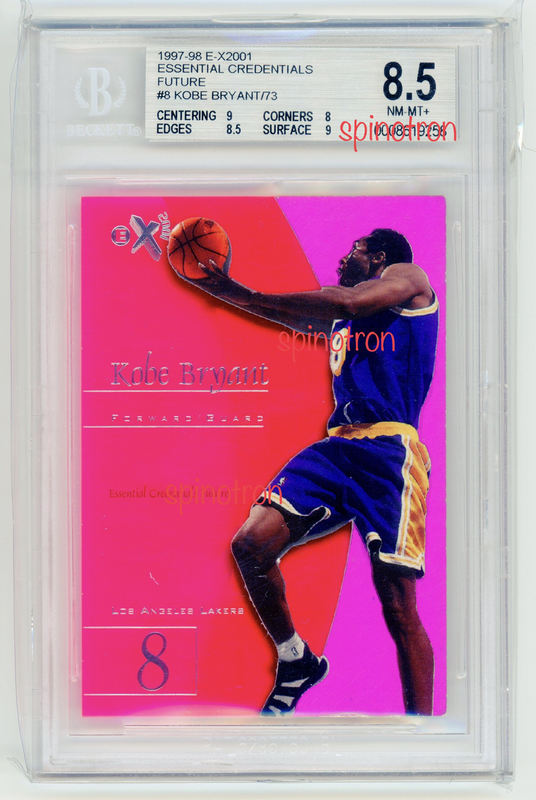 Logoman cards have been favorite among modern collectors. I am glad I can add this quality piece to diversify my collection. Special jsy stands out in GU jsy collection, similarly special jsy logoman stands out among various usual jsy logoman issued a few every year. 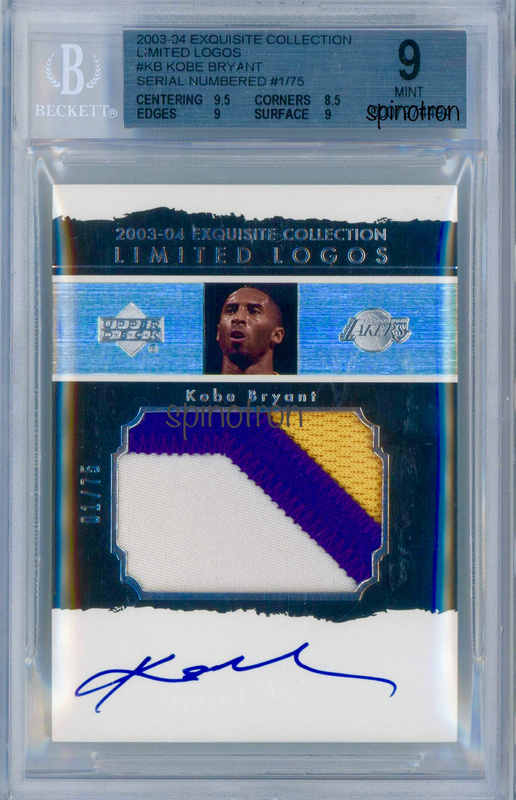 Kobe's only special jersey logoman. 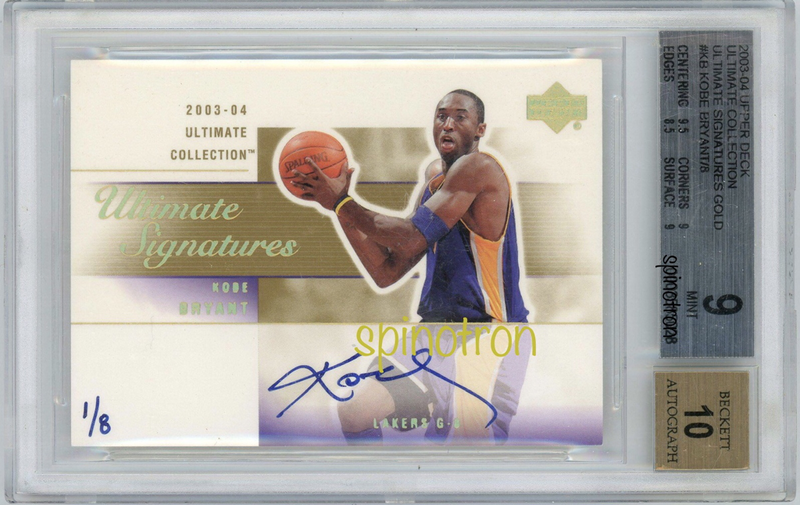 11-12 Preferred Silhouette Prime /10. 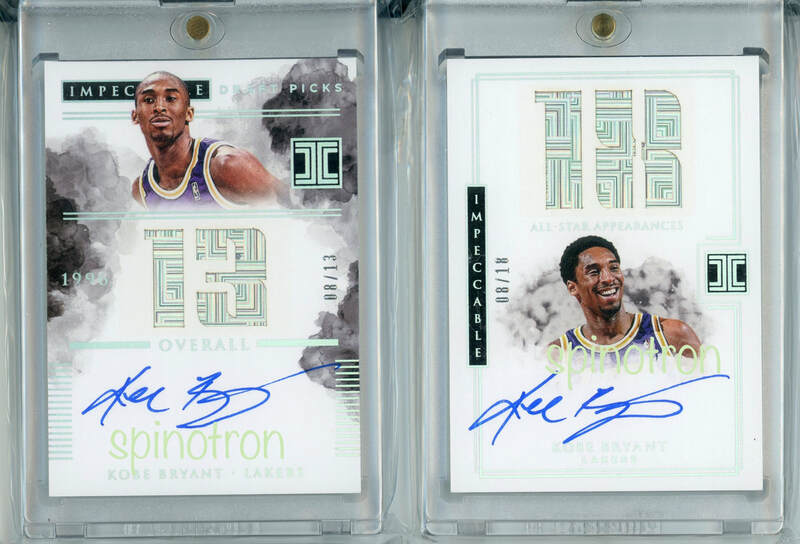 Credentials + LL + low print run=best Panini cards of this year! The patch is extremely sick, and 13 breaks. All the patches of Kobes prior to be inserted into cards have been databased in a picture on Panini's blog, so the patch is legitly fancy. The patch pattern is uniquely found in throwback/older jerseys. This is a very special card made from gold. Second year of such release. 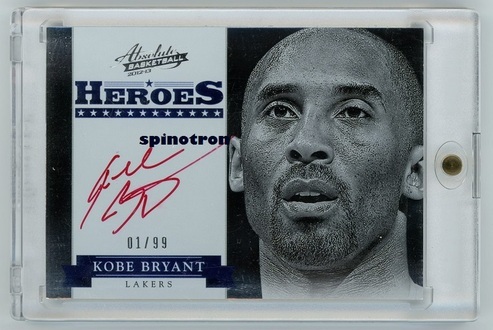 Thanks for a top collector Reid for letting it go to make my 1/1 count into 8. Kobe's first Panini auto in red ink. Only first five were inscribed in red. I do not have a Limited Logos in my collection yet. The print run gave me no urgency until price went up significantly. 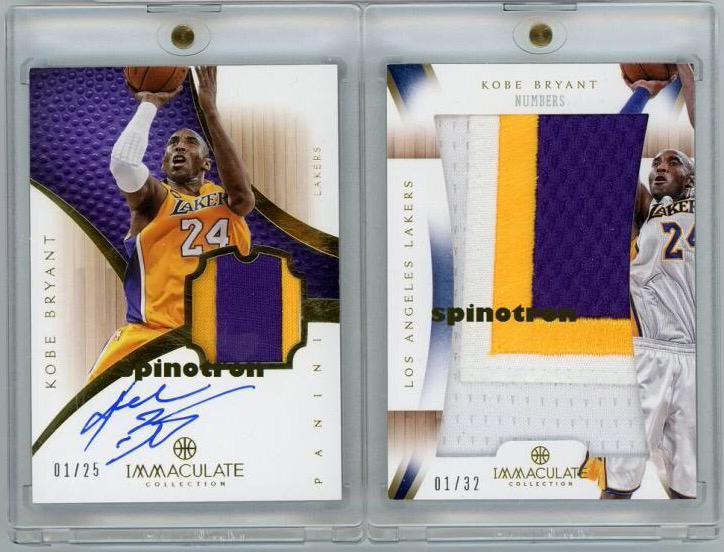 From the set-up of Immaculate, this Premium patch serves as a LL counterpart. /25 parallel is dubbed as Chinese red variation, which is a cool concept and a nice touch. 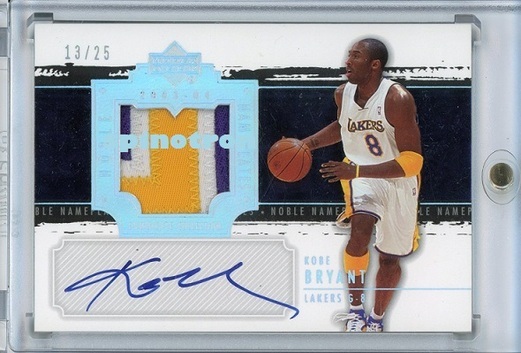 Nice to have a 4-break jersey numbered copy with a beautiful auto. Kobe acetate 24/24. Courtesy of a world class supercollector. 5 of 5 for the 5 time champion. 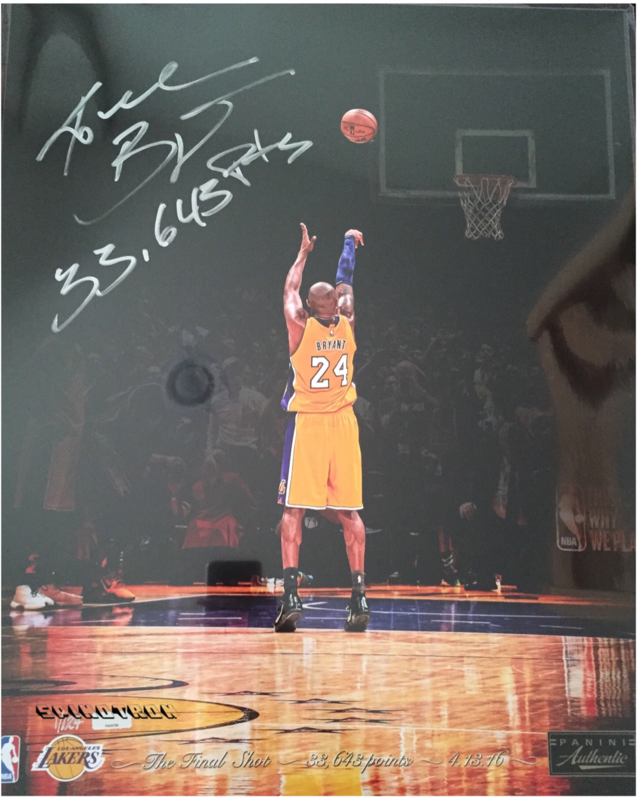 Kobe autographed poster, first numbered, with career total inscription. Best inscription ever, and 1/124!